His aid was on the side of Syracuse from 1995-98, first as the tight ends' coach and assistant offensive line coach and later as the offensive line coach under then-Syracuse head coach Paul Pasqualoni. At that time, Pasqualoni was the head coach and Addazio the assistant, where now they both return to familiar territory in reversed roles with the Boston College Eagles. When speaking on the nostalgia and connection he feels with Syracuse, New York, including his commitment to recruiting in Central/Upstate New York, Addazio shared, "Well, high school football Central in New York is awesome, and there are great players every year that come out of there." "My experience at Syracuse was really a phenomenal one," he offered, going back in time to his days on the Orange sideline. "We were part of three conference championships, three BCS Bowl games, and just incredible crowd in the Dome. It's entrenched in my memory of one of the most electric atmospheres I've ever been in in my career. I've got great, great friends to this day there, neighbor friends. I just think it's such an awesome community." "I respect Syracuse. I respect all the former players and everybody associated with that program, and I'm not going to speak for Coach P (Paul Pasqualoni). What he did there is legendary." Pasqualoni was the head coach of the Orange for 14 seasons, from 1991 to 2004. In that time, he attained 107 wins to 59 losses and one tie (64.4% winning percentage). He aided the Orange to nine bowl appearances in 14 seasons, meaning they went to the postseason 64.3% of the time he was at Syracuse, and won six of the nine contests (67% winning percentage in bowl games). Since firing Pasqualoni after a 6-6 season in 2004, Syracuse has had four different head coaches over the last 13 seasons (Greg Robinson, Doug Marrone, Scott Shafer, and now Dino Babers). They have advanced to the postseason just three times in 13 seasons from 2005-17, amounting a mere three winning records in 13 seasons since letting Pasqualoni go. "Obviously on this day, this the day that we play. It's all about one thing, Boston College," Addazio stated, getting back to the task at hand. "I'd be lying if I didn't tell you outside of that day, I always have a fond place for Syracuse University, without a doubt. I wouldn't be where I am today without Syracuse in my background. So that's probably as much as I need to dribble on about the team that we're going to go to war with here very, very shortly." Boston College, with former Orange assistant Addazio and former Orange head coach Pasqualoni are bowl-eligible already this season at 6-5 before playing Syracuse. Addazio has guided the Eagles through injury and an ever-challenging Atlantic Coast Conference (ACC) to becoming bowl-eligible in four of his five seasons at the helm of the team. 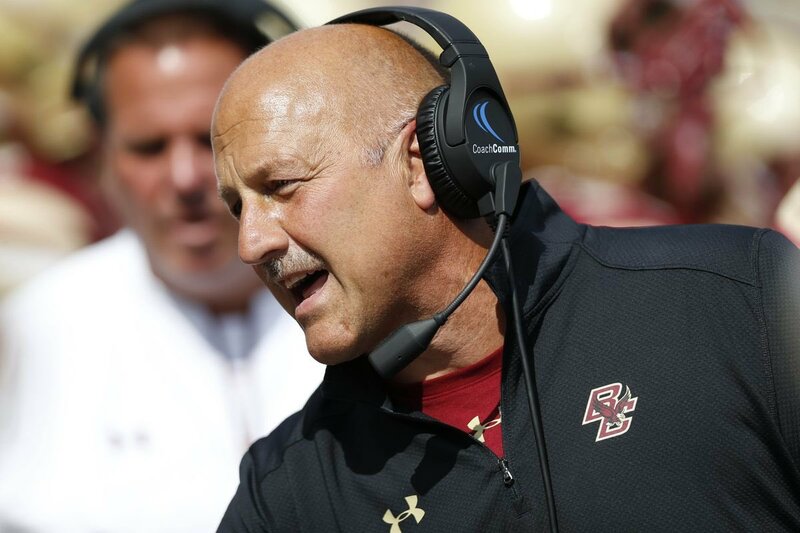 Speaking on implementing his plan at Boston College and seeing the fruits of his labor result in bowl eligibility in four of five seasons, Addazio offered, "I think it's all about this profession we're in, it's all about winning, and it's all about making sure that you have an upward trajectory. We've recruited well. We're developing well, and we're building. While we're doing that, we've been very, very fortunate. This will be our fourth opportunity in five years to go to a bowl game and to win a bowl game, hopefully. So in that building process, we're able to stay bowl-eligible and build." "We have a great young team with a bright, bright future," Addazio went on to say. "I think that's critically important. What I'm most proud of, to be honest with you, is that we've got unbelievably high-character kids that really, their academics are extremely important to them. It's a great place to be. It's a great locker room to be around. There are a big bulk of northeast kids, and they represent Boston College the right way." Boston College's 2017 roster is made up of 77 student-athletes who hail from the northeast of the United States and 35 from elsewhere, meaning that 69% of the Eagles' team comes from northeast states. "I think, like everybody else, trying to do the same thing, you want to do it with class, dignity, and you want to build your program. You want to have a model. Ours is toughness along with that. I think it's something our alumni and fan base can be proud of and want to be a part of," said Addazio. "Obviously, we're all in a foot race to develop and win as many games," he continued. "You set your goals. You want to win the opener, you want to get bowl-eligible, and at some point obviously you want to compete for conference championships. I'm not saying anything every other coach isn't saying. But along the way to do it the right way is critically important. I think teams in our conference do an unbelievable job of representing their universities and also our conference." Boston College defeated the Louisville Cardinals in Louisville, Kentucky, and the Virginia Cavaliers in Charlottesville, Virginia, two quality road wins in the ACC against teams that are bowl-eligible this season. The Eagles also got a win over the Florida State Seminoles, something that has been looming for the past few seasons and hung with the reigning national champion Clemson Tigers going into the fourth quarter on the road in "Death Valley" as well as were within a field goal of the N.C. State Wolfpack at the end of regulation, showing their fight versus the top two teams in the ACC Atlantic Division standings, Clemson and N.C. State, respectively. This is the 50th game between the Syracuse Orange and the Boston College Eagles on the football field. Syracuse owns a 30 wins to 19 wins advantage over Boston College, and have won the last two contests, both inside ACC Atlantic Division play.